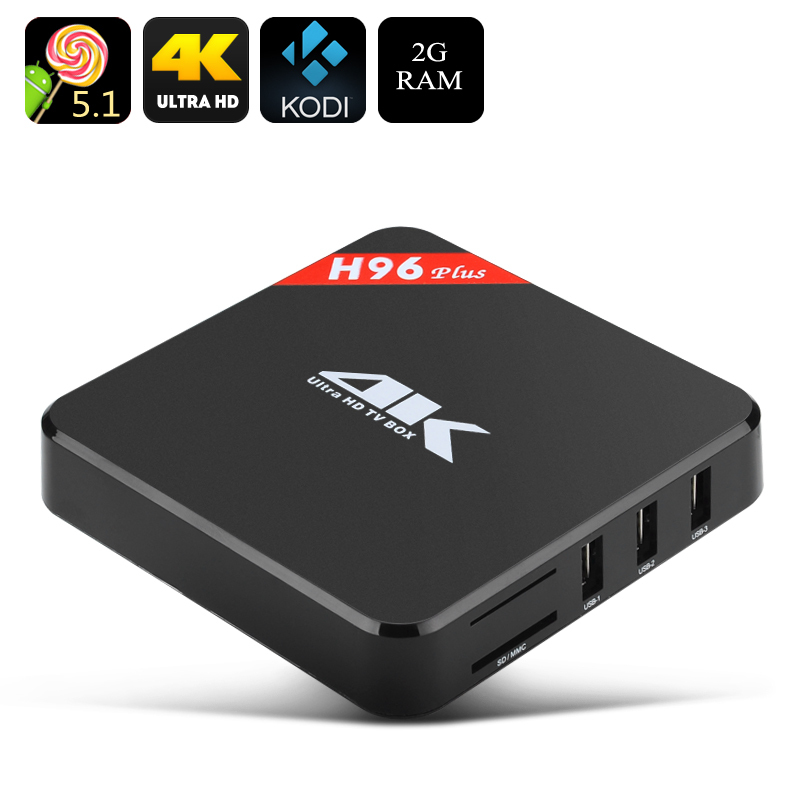 Successfully Added H96 Plus 4K Android TV Box - Android 5.1, Kodi, AMlogic S905 2GHz CPU, 2GB RAM, Mali 450, Remote Control, Airplay, Miracast to your Shopping Cart. This sleek black box with rounded corners has the power to turn your TV into an Android computer. With an Amlogic S905 processor reaching 2.0 GHz speeds, 2GB or RAM and a Mali-450 GPU is can bring HD TV, games and entertainment to your living room. Kodi 16.0 is preinstalled on the H96's Android 5.1 operating system so you will have access to a wealth of content via this versatile media player. Without a built in fan this mini-computer can sit inconspicuously under your TV and its silent running wont disturb any viewing. It has 4 USB ports for memory pens and all your peripherals such as mouse, keyboard or game pad along with room for extra storage with a micro SD card slot. Hook up your external speakers via the SPDI for superior sound to match the 4K resolutions that this TV box supports. The H96 Plus TV box also has DLNA, Miracast and Airplay support allowing you to play content on your Smartphone or tablet and have it display through the TV box without the need for any wires. There is the Bluetooth and wireless network functions available so you can set it up wherever you like and connect wirelessly for a hassle free installation. When it comes to making your TV smarter you cant go wrong with the H96 Plus Android TV Box and its available at an incredible price as well as coming with a 12 months warranty, brought to you by the leader in electronic devices as well as wholesale TV boxes..